The Marshall Tuck campaign released a new video this morning featuring some new endorsers. Kristen Bell, Dax Shepard, Joel McHale and Adam Scott have thrown their support behind Marshall in a funny new video featuring the four actors lending their political expertise to Tuck’s campaign. Two Walnut Valley teachers have been named semifinalists for the 2015 Grammy Music Educator Award. Instrumental Music Directors Steve Acciani from Diamond Bar High School and Dr. Buddy Clements from Walnut High School are among 25 semifinalists announced today by The Recording Company and The Grammy Foundation. For the second year, the Music Educator Award will recognize an outstanding music teacher who has made a significant and lasting contribution to the field of music education and who demonstrates a commitment to the broader cause of maintaining music education in the schools. “This honor has me very humbled, but also extremely proud of what our community is accomplishing through the amazing collaborative efforts and vision of our school staff, local professional musicians, business partners, parents, and the best students ever,” Acciani stated. “To have two schools in the same school district receive this distinction is amazing!” Clements said after hearing the news. Both music teachers were selected as quarterfinalists in June. “It would be the ultimate honor for me to represent music educators all over our nation, especially those who have devoted decades of their lives to teach their students not only about the joy of music but also how music can touch souls, heal broken spirits, mend shattered lives, build bridges across social canyons of injustice and prejudice… and because of this our love of music can be a worthy, life-long quest for excellence, compassion, creativity and expression,” said Clements. This year, 7,000 nominations were submitted from all 50 states. The 25 semifinalists come from 25 cities across 17 states. All semifinalists will have the chance to earn $6,000 for their music department through the Ford Drive 4 UR School program. Ten finalists will be announced in December and will be recognized for their remarkable impact on students. The winner will be announced during Grammy week in February 2015 and will be flown to Los Angeles to accept the award and a $10,000 honorarium. For every performer who makes it to the Grammy stage, there was a special teacher who played a critical role in getting them there. It’s time to say thank you to all the teachers who put in the extra hours to instill the love of music in their students. And that’s just what the people who bring the Grammy Awards plan to do with this award! The Los Angeles County Fair honored more community heroes on Friday. Every year, the fair celebrates the volunteers, students and seniors who make their communities a better place to live. This year, Walnut chose Lou and Joanie Simonelli for their volunteer work. The couple have spent many hours working for the band boosters at Walnut High School. Walnut’s Community Services Superintendent Alicia Jensen noted Simonelli’s dedication has lasted well past the years in which their own children went to high school. “The Community Services Department received a letter signed by 134 kids from Walnut High School praising and thanking the Simonelli’s for their efforts,” Jensen said in her nomination. Dubbed the Bandfather, Lou has driven thousands of miles with a pile of instruments behind him. The couple also build and maintain the play sets and pit carts. Along the way, these community heroes have touched the lives of many students, parents and teachers. The Walnut High School Jazz Orchestra will share the stage with the legendary Glenn Miller Orchestra for an evening of musical memories featuring hits from those Swingin’ Years of Big Band Era. Come join us between shows for a BBQ dinner. Proceeds from this special event will benefit the Walnut High School Instrumental Music Department. WHEN: Saturday, Oct. 18, Shows at 3 p.m. and 7 p.m.
For more information, please cal (909) 594-BAND. 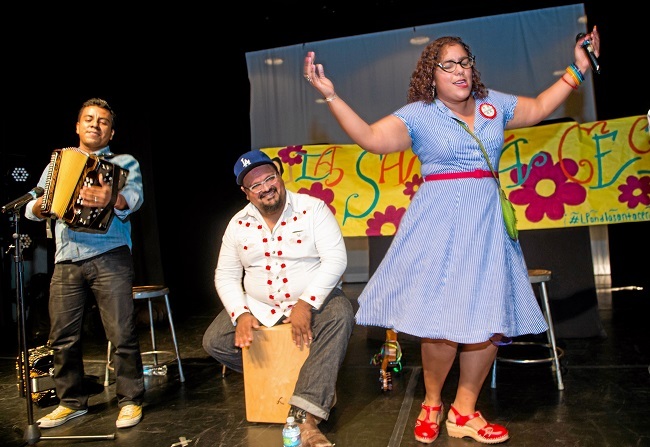 Grammy Award winners La Santa Cecilia brought a message of hope and happiness to La Puente High on Tuesday. The Los Angeles band, whose recording “Treinta Días” was honored for Best Latin Rock Album this year, agreed to help the Warriors celebrate Hispanic heritage month. They had been invited by history teacher Wesley Perez. So the enthusiastic instructor had his students share the afternoon with an inspirational band in the school’s Little Theater. They also shared dreams and goals during a question and answer session. “Why do many women, especially Latinas, have a hard time living independently,” asked 16-year-old junior Irene Martin. The band’s powerful singer Marisol Hernandez offered lots of interesting advice to the teens. She drew on her own experience growing up and joining the band. Along the way, everyone will face challenges, the singer said. The hard part is rising to the challenges so you can overcome them. Read more in Rich Irwin’s story PUENTE. 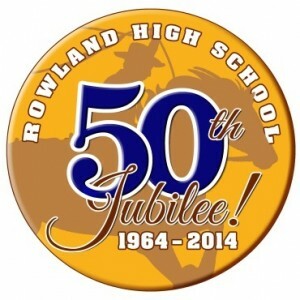 The entire community is invited on Friday, starting at 3:15 p.m. to celebrate Rowland High School’s 50th anniversary with a fun-filled, community jubilee. Rowland began as a small community where students were just as likely to ride a horse to school as drive a car, and the 50th Jubilee will celebrate with a good ole’ fashioned Country Western theme. “Being a lifelong Raider as a student, teacher, and now principal of the school, I am very proud of its history and traditions. 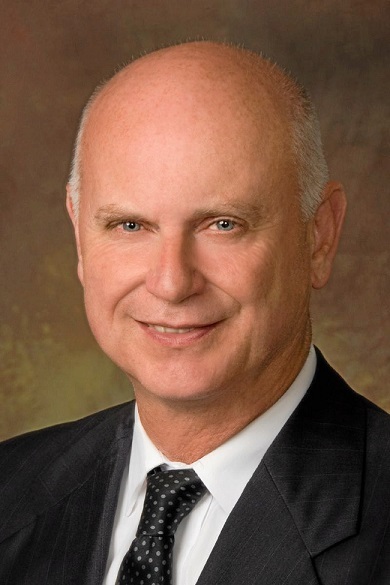 I look forward to highlighting the school and its connection to the community at our Jubilee and I hope everyone can join us,” said Rowland High School Principal Mitch Brunyer, who is in charge of the volunteer committee. Everyone is invited: alumni, students, parents, faculty/staff (past and present), and community members. For the latest information, visit www.rowlandhs.org. The campus will be filled with free activities such as game and photo booths, entertainment, visit “Memory Lane Displays” and tours of the new modernized facilities will begin at 3:15 p.m. There will also be a variety of food booths. A special opportunity to meet former and current faculty and staff including every principal in Rowland High’s history will take place at 6:30 p.m. in the gym. VIDEOS: Have fun learning a bit of Rowland High School history with new videos each day this week to celebrate the countdown to the 50th Jubilee with videos posted on You Tube – click HERE. D-Building: This building was expanded to nine classrooms housing science classes (Physics, Anatomy, Biology, Chemistry and Earth Science). Each room features individual lab stations, interactive whiteboards, voice amplification, chemical resistant cabinets, countertops and flooring and the chemistry rooms feature fume hoods. There is also a central common instructor’s work room that includes instrument and chemical storage. E-Building: This building mainly houses Career Technical Education classrooms. Every classroom has new doors, flooring and tackable wall surfaces. Many rooms have interactive whiteboards and voice amplification or are wired to receive the technology in the near future. The modernization of this building includes four new computer labs, the Rainbow Preschool facility, child care and home economics rooms. The culinary arts room was previously modernized, but recently also included technology upgrades. Aquatics Center: The new facility features a designed plaza entrance with an expanded 12 lane pool and deck. It has a shade structure with seating, a digital scoreboard, lighting, new filtering equipment and the infrastructure to add solar technology in the future. Restroom facilities for the athletes and public have been added along with team rooms, outdoor showers and a coach’s office. The Future: In the next few years, the community can look forward to: a state-of-the-art performing arts center, a new multipurpose room, eating facilities, student quad area, a two-story administration building with a new library on the top floor, and a new two-story classroom building that will replace portable buildings. The Walnut High School Drama Department is bringing to the stage The Understudy by Eddie McPherson, presented in theatre-in-the round. 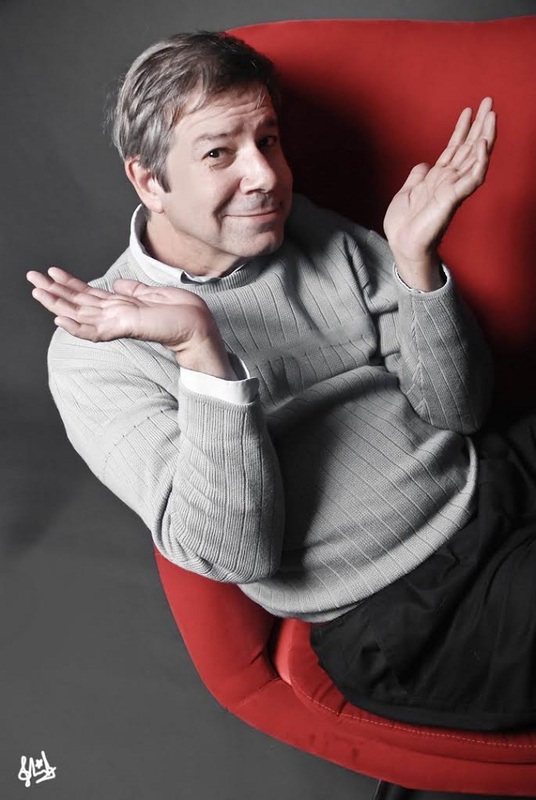 Drama teacher Joanne Karr directs the talented cast in this murder-mystery comedy. Acting can be murder! Dolores Gordon, who loves the stage, has always dreamed of stardom. But the only role she ever seems to land is that of the lowly understudy. So she decides the only way she is going to land the lead role in an upcoming community theatre production is to murder the lead actress, Guinevere Black. And that is exactly what she does. To make the murder more fun, Dolores hides Guinevere’s body in a large wooden trunk that is used as the centerpiece of the production. She realizes her worst nightmare when she discovers the body has disappeared. But who took it? Find out in this comedy that spoofs Agatha Christie and Alfred Hitchcock all in one-keep-you-guessing backstage comedy. Shows are October 1-4 at 7 p.m. and a 2 p.m. matinee on October 4. General admission tickets are $10 in advance and $12 at the door. Tickets may be bought online at www.seatyourself.biz/walnutdrama or at the door. For information, please call (909) 594-133 ext. 34212. The Walnut High Performing Arts Center is located at 400 N. Pierre Road in Walnut. 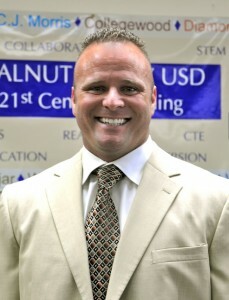 The Walnut Valley Unified School District Board of Trustees has approved two administrative positions for the 2014-2015 school year. Sergio Canal in the new Director of Pupil Personnel Services Secondary Education. Services/Secondary Education in the Educational Services Division. Sergio brings 18 years of expertise in the K-12 educational system. 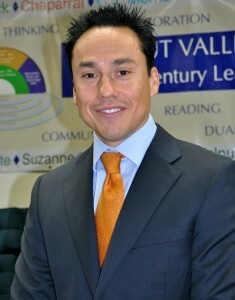 Most recently, he served as principal at Nogales High School. He has also been an elementary teacher, middle school assistant principal, and high school administrator. Transportation and Facilities. David comes highly recommended and brings a wealth of experience and leadership to the district. For the past five years, he supervised over 300 employees as director of maintenance at Veolia. David is also a retired Air Force E-7 technical sergeant and served our country for 20 years. Ecolab presented $37,000 in grants to Rowland Unified teachers on Thursday at its plant in Industry. The grants represent an 8 percent increase over the money donated last year to area educators. The company official felt “lucky” to be associated with the Visions for Learning Grants program since it began in 1997. The grants have grown steadily over the years. Individual grants range up to $3,000. This year, 23 projects were funded by Ecolab. 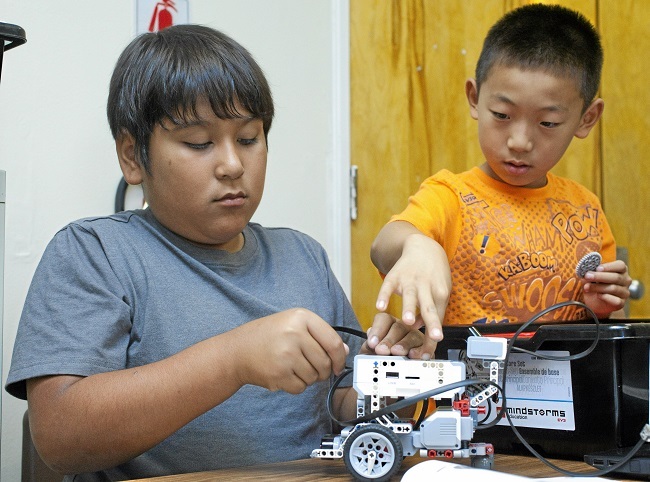 Science took the top spots, with both Villacorta Elementary in La Puente and Shelyn Elementary in Rowland Heights receiving nearly $3,000 each for robotic kits. Read more in Rich Irwin’s story ECOLAB.